If you’re willing to put a small hole in the glove box instead of cutting the loop, this is how to do it. The measurements: 225mm from the right hand side of the glovebox, and 10-11mm from the top edge of where the face of the glove box starts. drill a small hole (1/8″), and pull on the handle while pushing in and up with the coat hanger. it might take a few tries to hit the release, but it doesn’t take much to pop it loose. Once you are able to get the glove box open and remove the screws that hold the face to the backplate, you’ll see the inner workings as shown above. the mechanism itself contains a lot of small parts, but the piece that’s probably broken is the release. there is a small pin that protrudes from the right side of the actuator, and most likely it has been broken off. Once you are disassemble everything and are able to see where it’s been snapped off, that’s the point at which you need to drill a hole to insert the screw. i don’t know the size of the screw, but it’s very small, possibly 3 /32″ by about 3/4″. once the hole is drilled, you may have to wiggle the bit to get the screw to start threading it in. i did not tap it, as the actuator is made of a pretty soft metal. All of the pieces are very small, and careful notation of how everything comes apart is a necessity. Genius! Took me all of about 2 minutes to get the glove box open. I recommend just using the 1/8″ drill bit right through the vinyl and plastic. You can barely see the hole and chances are there are a lot worse things wrong with your Volvo anyway. 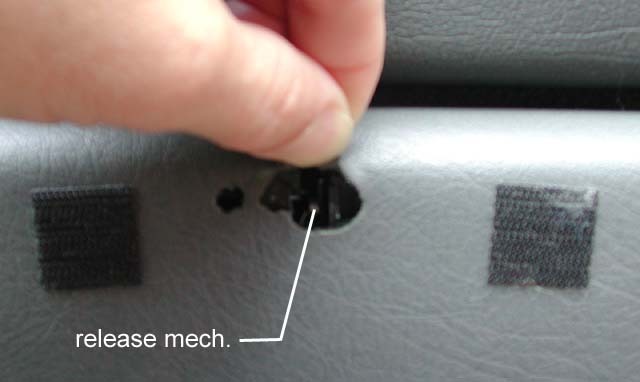 Another way is to carefully saw off the top metal wire clip in the middle of the glove box (tape area near cutting to avoid screwing up top of glove box), then once opened, use velcro to hold it closed until you have time to repair if so inclined …as it will be functional albeit without locking. I opened the locking mechanism using a 3 mm thick and approx. 40 cm long metal rod (the handle from a paint bucket). The rod was bent 90 degres 1 cm from the end and a “handle” is bent in the other end. The distance between the 1 cm bending and the handle must be approx 20 cm. (a little longer than the hight of the glove box). 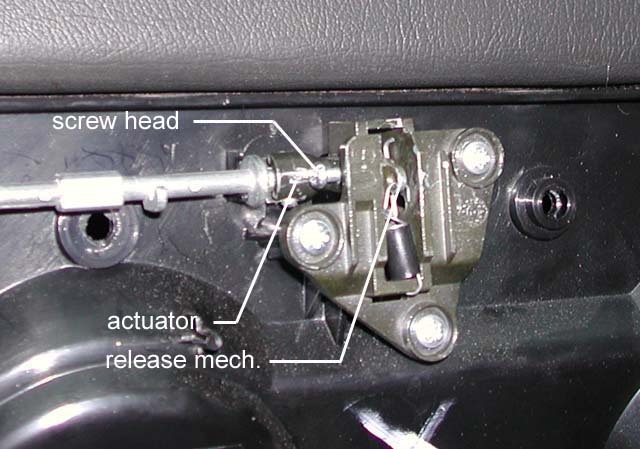 The rod can be inserted in the bottom of the glove box door between the inner and outer part. There is a screw in the middle holding the two parts together but 5 cm to the side of the screw it is possible to make an opening. Maybe I was lucky but after a few minutes I succeded in hitting the locking mechanism where the spring is attached and the door opened. No holes drilled and no clip was sawed. The problem was the broken metal stud that was replaced with a screw as described above. Great to have the pictures that helped me to understand the function of the lock. Thanks, this has been useful in fixing my glove box latch mechanism. I got someone on ebay to repair the old latch for a very nice price-, very inexpensive -12.00 or so. New ones don’t hold up, as I am one my second glove box break-in with the hacksaw and replacing the latch. The first time I spent 100.00 at dealer. THE PROBLEM, in the process of replacing the latch catch piece attached to the frame (the small catch is it?) I dropped the two tiny screws and screwdriver back behind and below the glovebox. Now they are hiding down in there somewhere and I cannot seem to remove the glove box to retrieve. One arm released just fine, the other one is stuck. No matter how much I try the release pin hole does nothing and no amount of pulling and pushing from the other side. I don’t want to break it. Maybe best to buy more screws and forget the screwdriver, it was a handy 90 deg thing for awkward places. I used the very helpful measurements in Step 1 to mark for drilling. Right on the money. I used a much bigger drill bit than necessary but I was not concerned with cosmetics. Figured to rig some kind of wire opener. Step 1 measurements so good that my glove door popped open the instant I drilled through the plastic. Later realized that the bit, had caught the latch retaining spring and stretched it a little (whew! that was close). The door latch works fine (opens and closes). A small flathead, coat hanger or little key can get in and simple lift the latch spring, freeing the door. Finally, I worried about this and Googled the problem for two weeks. Most of the fixes, and there are lots posted for this common problem (Google Volvo 850 glove box stuck), can be very model year specific. 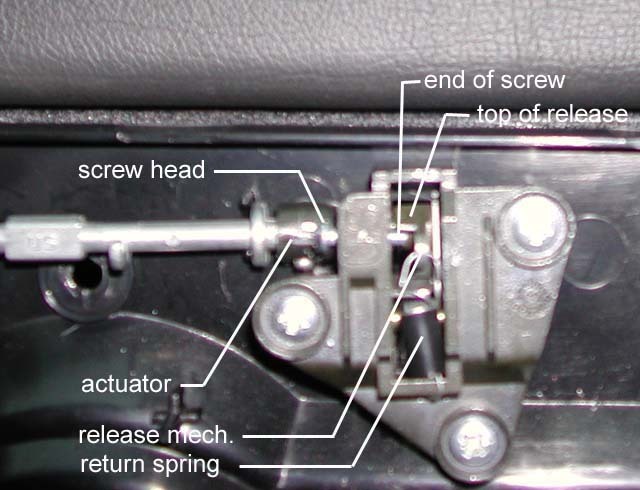 My 95 had no space underneath the door for a wire unlatch and on top I have a air bag which was not on earlier models.